Located a mere 15 miles to the west of Dublin city centre, Carton House is set to become a popular golfing destination. The 1,100-acre walled Carton Estate dates back to Norman times and a new luxury four-star hotel is currently being built in sympathy with Carton House, the existing ancient mansion. Carton House is not only located in a beautiful setting, but it’s easily accessible. 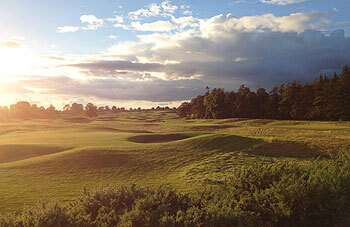 There are two courses, the more senior O’Meara, which opened for play in 2002 and the Montgomerie, which opened the following year. Both are contrasting in style: the O’Meara is park-like and the Montgomerie links-like. This is the second course to be designed by “Monty” and he was helped and guided by Stan Eby of European Golf Design. It’s an interesting sculptured layout which stretches out to a massive 7,300 yards from the championship tees. Without huge defining sand dunes, links-type courses can be flat and featureless. The Montgomerie course gets its definition from manufactured undulations; swaying fescue grass, clear definition between the cuts of grass and the many deep pot bunkers. It clearly has a modern look and feel but it’s an honest an unpretentious driver’s course which hangs together rather well. There is no signature hole to speak of, just one good hole after another, and the par threes are especially noteworthy. Clearly delighted with his creation, Colin Montgomerie said: “This is a unique project and I am privileged to be associated with it. You can’t call it a links course, but it plays like a links and has all the characteristics of a links. In designing this course, I attempted to go back to a more traditional course. I looked at the great courses around the world – Royal Melbourne, Troon, Turnberry – and worked out what is so good about them. One thing that springs to mind – bunkering. They are hazards and they work with the prevailing wind. Few holes are straight up and down the wind but tend to be across, which brings the bunkering into play. This is the kind of course where the best players would always come out on top”. A record prize fund of €2,200,000 was up for grabs at the 2006 Irish Open at Carton House, played on the Montgomerie course, and Thomas Bjørn claimed the title. The event returned to Carton House in 2013 with a reduced €2m prize fund and England's Paul Casey sailed to claim the Irish Open title after being stuck in the doldrums for two years. In May 2005, for the first time, the Irish Open was held on Monty’s new creation. Wales’s Stephen Dodd emerged victorious after beating England’s David Howell in a playoff. This was to be Howell's second shootout disappointment after losing in the previous week to Thomas Björn in a tense three-way playoff at the Forest of Arden in the Daily Telegraph Dunlop Masters. Despite six birdies in the final round, Monty couldn’t recover from a third-round 75 and he ended on his own course tied for 28th place. The Irish Open was staged over the Montgomerie course in 2006 and the event returned to Maynooth in 2013. Here's the good news -- The Carton House is a warm and wonderful top notch resort property, fortunate in having two good and different golf courses to choose from, with The Montgomery being better of the two (with The O'Meara being more "easy going" ... parkland, but almost Monterey, CA-like, how native trees, bunkering and rough outline many of the fairways). The less than good news? The difficulty playing the course lies in redundant deep bunkering, both in the fairways and around the greens. Even Monty said, "I looked at the great courses around the world -- Royal Melbourne, Troon, Turnberry -- and worked out what is so good about them. One thing that springs to mind -- bunkering." Fine ... but does nearly every bunker need to be so deep, that when you're stuck in one, playing partners can't even see your head? Don't mind a tough round at all -- but when the course relies on the same feature, over and over, to introduce difficulty -- it actually takes away from the beauty and challenge of the rest of the course. Finishing hole more parkland-like and a bit out of character ... leaving one to wonder, "what course did I just play?" The front nines from both courses would make the better composite 18, in my humble opinion. Don D.
Just come back from Ireland after playing three top courses - The K club, The Hermitage and The Montgomerie at Carton House. All courses were relatively tough in their own way, but The Montgomerie was the most bland, featureless and uninspiring. On the plus side I like the fact that there are a lot of bunkers and they are really deep. This is proper punishment for not finding the fairway. The greens were quite quick and had various contours but they were manageable for a 13 handicapper like me. I would say play this course at least once to test your skills at keeping out of the bunkers, but because there is no real stunning scenery to speak of I won't be returning (despite carding a 86 for my best round of the week). I read your review to consider places to play while in Ireland. I would like to know the experience you had , good or bad and why. The earth mover who retired to the Bahamas is a little ....much and totally ....stupid. Stick to the review and save your space wasting diatribe for your travel book. Hi Tom, I wished to emphasise that they have moved a lot of earth this Golf course (compared to many) to sculpt this track and spared no expense in doing so. I'm sorry you did not like the style of my writing. thank you for your feedback and the opportunity to explain it to you. Enjoy your golf in Ireland it is a wonderful place and carton House is an establishment of the highest quality. It is just not as natural as some others but it is a stiff and varied test in fabulous condition with unrivalled off course facilities It is just not really to my taste, yet. Try Headfort New. For the record I've played all over the world , I've been a pro (very bad one) and play I off of one. I play a lot still. You cant play them all but I'm trying. Also, have you played it? I look forward to your review if you have. Best wishes. I played "The Monty" at Carton in late December 2011. It is in superb condition. I love the fact that you tee off on the 1st from County Meath and play the rest of your round in County Kildare. It has just secured the Irish Open again for 2012 and is a worthy venue. Long, dry all year round, beautiful and a real challenge. Always take an extra club for your second shot. Not bad value too if you're a good negotiator. Much better than the sister "O'Meara" course. This is a clever golf course. There really is nothing quite like it. Monty set out to design an inland links, and for the most part he achieved this. As others have said, the pot bunkers are its defence. Don't believe for a moment that they are any less severe on the fairway than around the greens. If you drive into one, it really is a case of hitting a sand wedge back into play and taking your medicine. There really are very few courses that I have played where you have to think so much about every shot, particularly if the wind is whipping across the undulating acres. The conditioning is also superb. We played last week and the course looked set up for May, not February. It may not be to everyone's taste, but it is a proper test of your golfing skills. You may not fall in love with it, but you will certainly be in awe of it. Off the course, the Carton facilities are second to none, including the National Golf Academy with superb practice facilities. I have played over 100 courses in Ireland and the Monty course manyl times. It is my favourite course in the country. I have played the K. Club, the PGA, European Club and other beautiful courses but I just love Carton not only for the quality of the course but for its setting as well. It has a really links feel about it with some beautiful views of the woods surrounding parts of the back 9 and it offers a fantastic view on the castle from many holes and especially the 17th and the 18th which are great finishing holes with water. You can score very well on those 2 holes or lose the ball as well right and scratch them. The course is always in immaculate condition (greens are top class, fairways, bunkers...). The design is really good and challenging and meeting the bunkers definitely brings another challenge to a round. The club house itself is worth a round of golf at Carton! If you have never played this course, give it a go, you will love it! I have played this course ever since it opened and will continue to do so for a long time.As as inland links, it has no equal in ireland. The greens are excellent with lovely rolling fairways.I kept the best or worse,till last, depends if you are in them. The bunkers. There are 145 bunkers. Some of them 10 ft deep. You have to stay out of them or your scorecard will disimprove drastically. A wonderful course, with a good 2nd course in the O'Meara on the estate. If you like the going tough, then the Monty course is for you. It's almost as hard as Carnoustie or Troon. They market the course as an inland links and it does feel a bit like that, but you know in your heart that you’re playing a manufactured inland track. That said, if you like brilliant conditioned courses, fast greens, great service and a seriously difficult test of golf then this course will tick all those boxes. This course should be in the Top 100 on pure merit.